Read more about Reimage System Requirements, EULA and Steps to Uninstall. Reimage Plus (Reimage PC Repair) is a unique online computer repair service that can reinstall Windows by restoring corrupted or missing Windows files. 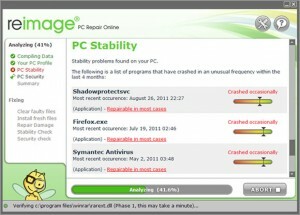 Its official website states that the software can revive your system and restore its peak performance. The application can fix Windows errors, damaged DLLs, computer freezes, Blue Screen of Death errors, and more. It must be mentioned, however, that Reimage only repairs files that belong to Windows operating system. It does not fix Microsoft Office or other third party components. Reimage license key costs $69.95 and it comes with 24/7 technical support. It also provides full money back guarantee in case you are not satisfied with its services. Although Reimage Plus is the only software of its kind, which can allow you to fix your Windows without reinstalling them, it also has certain drawbacks. This article will discuss both the pros and cons of the application and help you decide whether or not you should download Reimage. Why you need to download Reimage Plus? After you download Reimage and install it, the program begins its scanning process. During this scan, the application checks your system for modified files and registry entries. It also detects programs that cause crashes and provides you with such information as how much free space you have on your drive, how hot is your processor, and other details related to your system stability. This data is presented to you in non-technical terms, so it is easy to understand even for users that do not have much experience when it comes to computers. ReimagePlus is safe and up to date! Another advantage of the scan is that it checks your PC for malicious threats. This means that it can detect viruses, Trojans, worms, rootkits, browser hijackers, adware, and other unwanted files and programs that may be causing harm to your computer. Even if you already have a reliable anti-malware tool installed on your system, it never hurts to double-check it, because no security tool can guarantee to detect all issues. 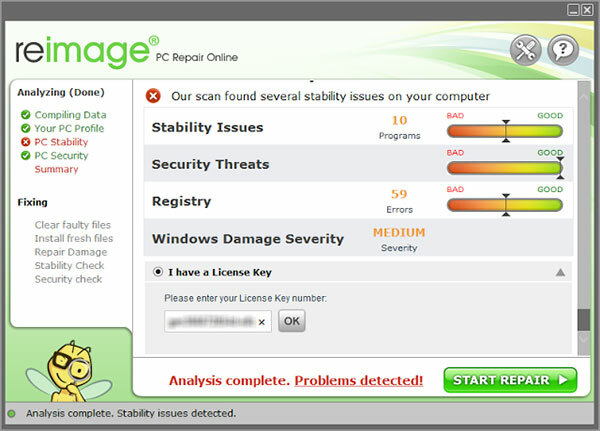 Reimage Repair uses a malware scanner that is powered by several systems, so if there are any parasites on your computer, it will be sure to identify them. The scan takes about 5 minutes or less. Once the scan is complete, Reimage will present you with its recommendations. It will show you issues that it can help you with, however, if it detects problems that it cannot repair, it will inform you of this as well, so you know exactly what the application can fix. After you accept the recommendations, Reimage will move on to the repair process. This process may take about 30 minutes or longer, depending on the condition of your PC. Once it is done, your computer will restart and you will be presented with the repaired desktop. It is possible that Reimage restores the links that you have deleted from the Start Menu manually. This, of course, is a minor issue, and if it does happen, you will need to erase the links that you do not wish to see in the menu once again. As it has been mentioned above, Reimage PC Repair is not perfect. One drawback of the software is that you need to have a working Internet connection to use it. The utility connects to the Internet in order to access its database of Windows files. This means that if you have any issues with your Internet connection, you will not be able to implement the software. Another issue related to the Reimage is that it may down-date your files, that is, it can install their older versions. The reason this may happen is because the database that is used by ReimagePlus needs time to retrieve the newest Windows updates. That is why it may downgrade some of your updates. This does not cause any harm to your system. After the repair is complete, Windows will simply re-update the down-dated files automatically. In case any problems occur during the repair process itself, you can always contact the free tech support that will help you solve them. You can reach the expert technicians at any time as the tech support is available 24/7. If necessary, they will set up a remote session and run the utility for you. Moreover, Reimage Repair comes with a built-in Undo button that you can use, if you decide that you want to undo the changes that it has made. You have to use this button when you uninstall the application, if you want to get a refund. If you download Reimage and run its free scan, you will be asked to purchase the full version of the program before you can use all of its features. The price of the program is $69.95 for one year on one computer. If you want to use it on two other PCs, you will have to pay an extra $30. As it has already been mentioned, you can get your money back, if the software does not help you with your Windows problems. In summary, it can be stated that although Reimage Plus is not an ideal application, it is the only tool that can reinstall Windows in place. If you are not an experienced computer user, it can help you fix system errors without having to reinstall Windows manually, which is not something that everybody knows how to do. Although it is not cheap, it can help you save time and money by preventing you from having to visit computer repair shops. Reimage is easy-to-use and its technical support team is always there to assist you with the repair process. 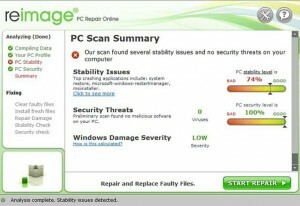 Reimage PC Repair scans your computer, evaluates its condition, and repairs the corrupted Windows operating system files. The highly renowned tool can improve your PC speed, ensure its stability, and restore settings and registry values affected by malicious programs. The unique application connects to its online data base, which contains over 25 million authentic Microsoft files, and replaces the damaged Windows files thus restoring your computer's peak performance. Get ReImage Read more about Reimage System Requirements, EULA and Steps to Uninstall.